McMaster has launched its 2019-2021 IT Strategic Plan. The three-year plan provides a roadmap that will guide the development and implementation of a variety IT services and technologies, based on feedback and input from the McMaster community. A connected McMaster community that will be engaged in conversation as services and technologies are implemented over the next three years. A seamless foundation of IT infrastructure, including networks, server function, data centres and security that will support future technologies as smoothly as possible. Transformative information technology and services that allow IT to be better integrated into everyday activities on campus and provide a sense of delight for users. One key project in development is a mobile app that will help streamline information and processes for students – avoiding long lineups at the beginning of the semester, for example, by giving students the ability to line up virtually, then show up at a specific time to speak with someone. But there’s much more, says Gayleen Gray, assistant vice-president and McMaster’s chief technology officer. A launch event will be held on January 23 at 1:30 pm in the L.R. Wilson Concert Hall. Details about the event can be found at https://dailynews.mcmaster.ca/events/mcmaster-it-strategic-plan-launch/. 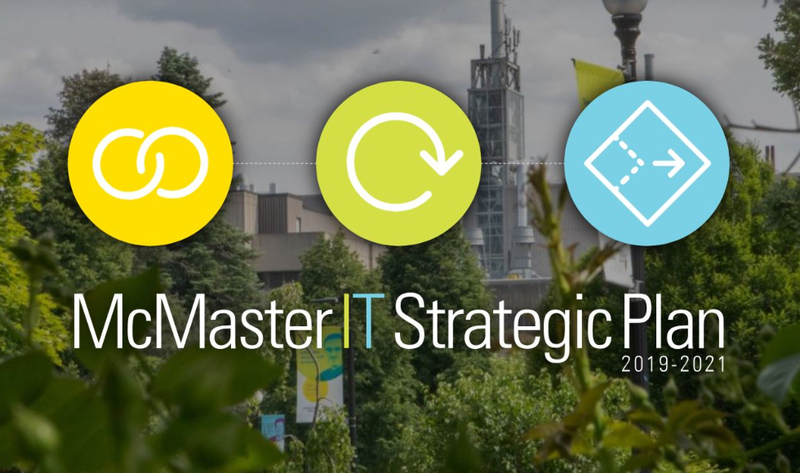 For more information on the IT Strategic Plan, go to https://it-strategy.mcmaster.ca/. McMaster has launched its 2019-2021 IT Strategic Plan. The three-year plan provides a roadmap that will guide the development and implementation of a variety IT services and technologies, based on feedback and input from the McMaster community. [embed]https://www.youtube.com/watch?v=TssytKvcXuY[/embed] The plan is based on three pillars: <ul> <li>A <strong>connected McMaster community</strong> that will be engaged in conversation as services and technologies are implemented over the next three years.</li> <li>A <strong>seamless foundation</strong> of IT infrastructure, including networks, server function, data centres and security that will support future technologies as smoothly as possible.</li> <li><strong>Transformative information technology and services</strong> that allow IT to be better integrated into everyday activities on campus and provide a sense of delight for users.</li> </ul> One key project in development is a mobile app that will help streamline information and processes for students – avoiding long lineups at the beginning of the semester, for example, by giving students the ability to line up virtually, then show up at a specific time to speak with someone. But there’s much more, says Gayleen Gray, assistant vice-president and McMaster’s chief technology officer. “Technology is embedded in everything we do, no matter what our role is on campus,” she says. “We’re looking at what kinds of technologies are available for teaching and learning. We’re also going to be exploring research infrastructure and technology to help support our researchers. The plan is moving us forward in a cohesive way with priorities and direction around our technology footprint here on campus.” A launch event will be held on January 23 at 1:30 pm in the L.R. Wilson Concert Hall. Details about the event can be found at <a href="https://dailynews.mcmaster.ca/events/mcmaster-it-strategic-plan-launch/">https://dailynews.mcmaster.ca/events/mcmaster-it-strategic-plan-launch/</a>. For more information on the IT Strategic Plan, go to <a href="https://it-strategy.mcmaster.ca">https://it-strategy.mcmaster.ca</a>/. Commas and hyphens and style, oh my! McMaster staff members now have an updated editorial style guide for their writing and editing questions. The Committee to Recommend a President is hosting two open sessions to hear from students, faculty and staff about the experiences and attributes they think McMaster's next president should have.